This may be my favorite thing to see in the winter...a big bull bison covered in frost. The winter coat of a bison is so well insulating that there isn’t enough heat escaping their body to melt the frost. I’ve been able to photograph this bull several times over the last couple years. His exceptionally red coat, and the red patch on his face, make him easily recognizable. Bighorn sheep are fairly elusive for most of the year, as they spend most of their time in the mountains. 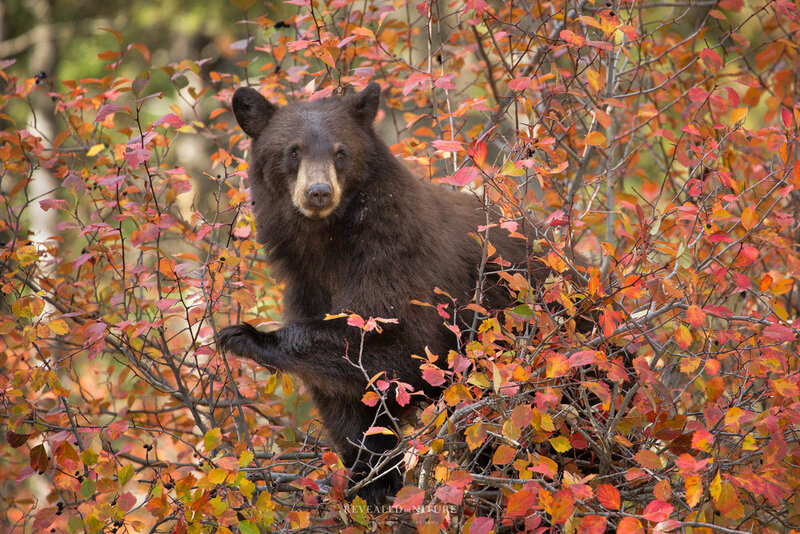 In the winter they are forced down to lower elevations to feed and become much more visible. 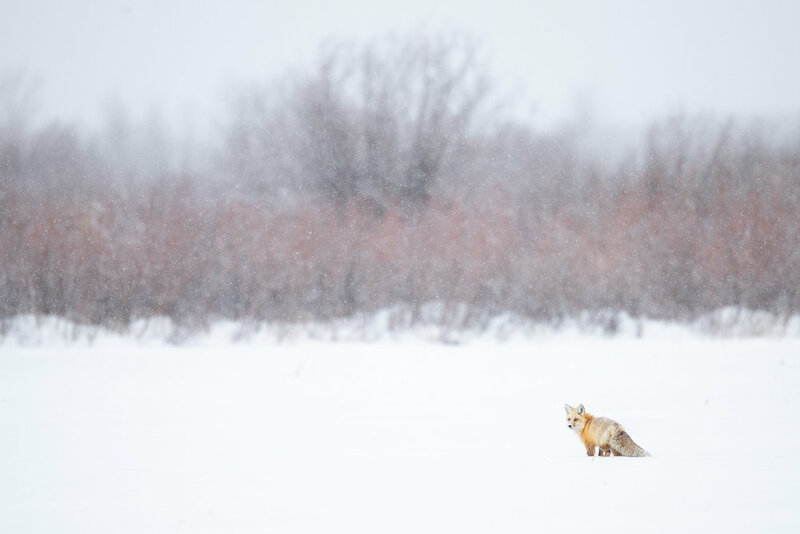 There are few things I find more visually striking than a red fox against the white snow. I found this fox as it was hunting for rodents under the snow. The fox will listen carefully for movement under the snow, turning its head back and forth to pin point the sound before leaping into the air and diving head first into the snow. As winter settles and temperatures reach -40 degrees, perhaps no animal is as well prepared to survive in this unforgiving climate. 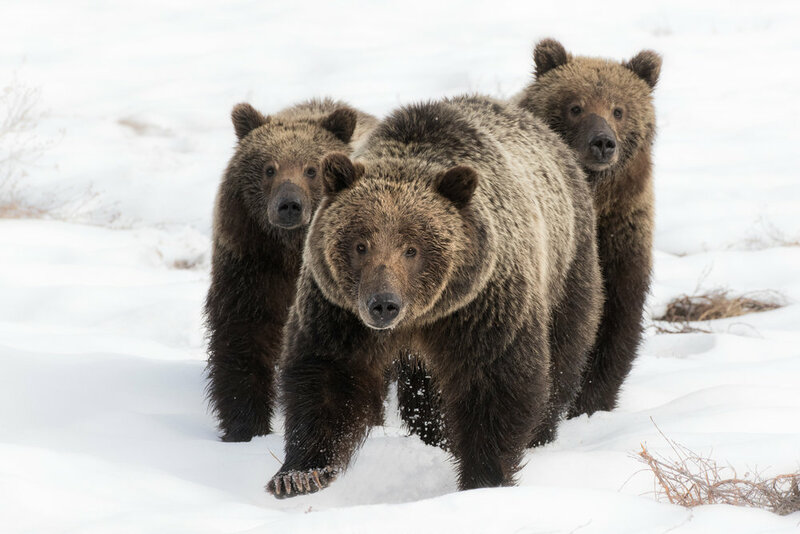 The distinct shoulder hump on their back, which is actually a protruding muscle, allows them to function as a 1 ton, living snow plow. Unlike other ungulates, such as moose and elk, which scrape with their front feet to access food under the snow, bison use this muscle to rock their massive heads back and forth exposing grass and sedge buried under several feet of snow. Some bison will opt out on this “snow-plow” technique, preferring to graze alongside thermal features where the warm steam from geysers or hot springs melts the snow on the surrounding grass. 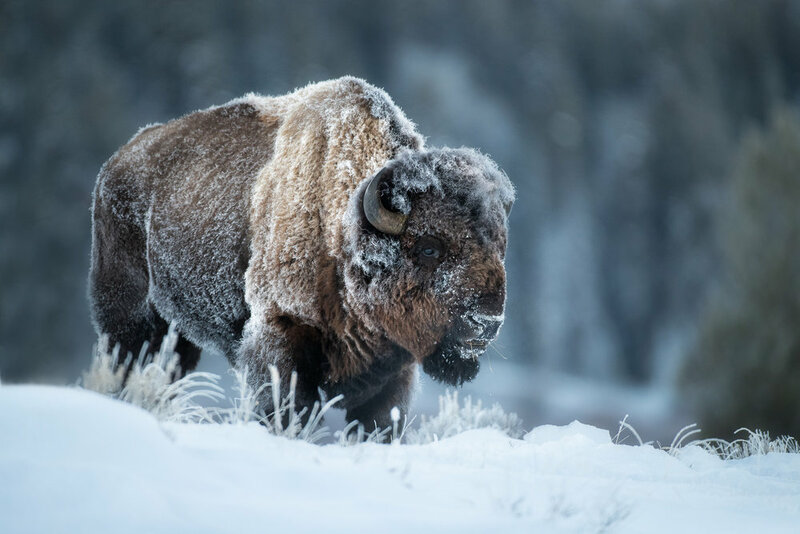 When violent winter storms hit, prompting other wildlife to seek shelter from the chilling wind and blinding snow, bison just plop down where they are and wait it out. Their winter coats are so thick and well insulated that the falling snow doesn’t even melt on their back. In a heavy snow, you can watch the largest land animal North America vanish before your eyes in a matter of moments. A humpback whale dives to begin bubble-net feeding in the Great Bear Rainforest. While the cow elk are busy raising their young, the bulls stick together in small bachelor herds. Thanks to the nutritious grazing opportunities summer provides, their antlers, covered in velvet, begin regrowing up to an inch per day. A cow elk walks the bank of the Madison River with her newborn calf. Two newborn elk calves prepare to cross the Madison river to join their mothers. 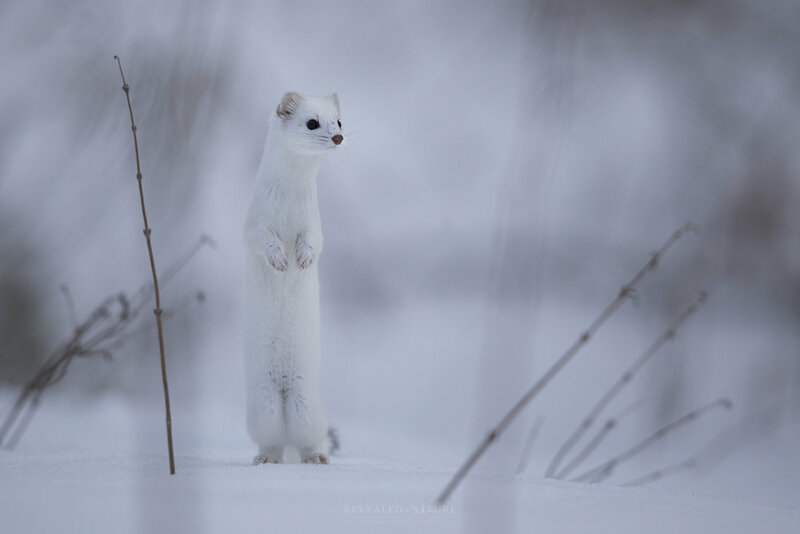 At first glance these slender weasels appear at a serious disadvantage when it comes to keeping warm in the winter. They have practically no body fat, and relatively little fur in their winter coats, but an ermine has several unique features and strategies to make up for it. For one, their coat turns from brown to white each winter, allowing them to be nearly invisible as they move through a snow white landscape. Their tail has a black tip on the end, which functions as a decoy luring any potential predators to strike there, rather than a more vulnerable part of the body. To make up for a lack of body fat and extra fur, they generate body heat with their cranked up metabolism. Essentially, they turn their body into a heater, eating up to 6 times a day. When ermines do take time to rest, it needs to be in an insulated location. The den of a chipmunk or vole they just killed fits the bill perfectly. Another tactic ermines are known to employ is actually lining the inside of a log or den with the fur of their victims to keep warm. The past few days have brought the first taste of fall to the Tetons. The occasional bull elk can now be heard bugling, and sporadic stands of aspens have already transformed into a blazing yellow and orange. I photographed this bull elk with clients the other day during one of my Grand Teton photography tours. We didn't just luckily stumble across this bull elk standing against the skyline at sunrise. As I have talked about before, the best images are the result of a plan and much thought. We set up on this elk herd in the dark while they were still a long ways off, but I knew, based off of typical elk behavior, that the herd would soon leave the open sagebrush flats and head into woods for cover. They do this every morning around sunrise. So, we positioned ourselves to the west of the elk herd and between their current location and the woods, so that they would pass by us as the rising sun illuminated the clouds in the background. Of course, there were variables out of our control, such as the exact timing the elk would move and the precise path they would take. Sure enough, the herd began moving towards the timber as the sun broke subtly through the clouds. We had our eye on the bull. As he followed behind cows he began walking this small ridge. One last minute thought played the final role in the making of our image. I needed his whole body to be isolated against the sky, and at first it was only his head and antlers. The mountains were behind the rest of his body. We quickly scrambled down into a ravine in front of us and fell on our knees. Just in time for the bull to pause and turn his head. Yes, drawing inspiration from photography is important, but not at first. Photography is too easy to copy without much thought. The value in drawing inspiration from a different medium is that it is not immediately replicable. Much thought is required to incorporate elements from a meaningful painting into your own photography. The process forces you to be creative. Remember, we want to be creative, not merely emulative. I could spend all my time giving you technical advice, camera settings and photoshop tips (all of which we will get to), but it would be in vain without first cultivating your own creative vision and artistic eye. I mentioned earlier that my time in the Wildlife Art Museum challenged me on a fundamental level. Few, if any of my photographs evoked emotion, told a story, or conveyed a mood like these great paintings. Sure, there are obvious differences between photography and paintings. One of which is that the painter has total control of the elements and creates art from a blank canvas, while the photographer is often reacting to the elements unfolding before them. Truly, what the painters envision they create. As photographers we don’t always have this ability, at least not fully. But rather than allowing that to become an excuse, I let it be a challenge. What if I envisioned the scene I wanted beforehand and then went after it? What if I poured my time into making a couple images of wildlife on a dramatic landscape that told the story of where they lived and evoked a mood? What if my approach to photography was proactive, not merely reactive? What if, accepting I may not have control over all the elements as a painter, I use research and knowledge of my subject and setting to reduce as many variables as possible and so increase the chances of making a truly remarkable image? These were just a few of the take-aways from my time in the museum, and in the weeks that followed these thoughts produced some of my best work.